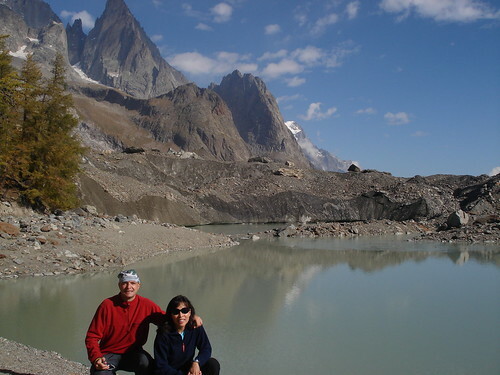 We drove to Courmayeur ski resort in Italy, just the other side of Mont Blanc, just over an hour from home. Great hiking in high alpine valleys, littered with huge glaciers. The photo is of Lake Miage. Touching the back of the lake is the tip of the Miage glacier ( hidden a bit by dirt) – the biggest glacier on the south side of Mont Blanc. We could hear the ice melting and dropping into the lake.